If your inter-capital Eurostar journey is delayed or cancelled you can submit a claim to them directly for compensation. For everything else, the information below will help you. If your Eurostar journey was disrupted, you may be able to claim compensation if the delay was Eurostar's fault. Just wait 24 hours after arriving at your destination and make sure you’ve got a copy of your tickets. You can submit a claim up to 60 days after the date of travel. Compensation is awarded if the cause of disruption can be attributed to the rail operator. For example, delays resulting from unscheduled engineering work, signalling problems or a breakdown. Eurostar aren't liable for things beyond their control e.g. extreme weather ( force majeure), vandalism or other act of malevolence (e.g. cable theft) or trespass. The rail operators are under no obligation to refund or exchange tickets when it isn't permitted by the fare conditions. We strongly recommend obtaining travel insurance if you buy non-refundable tickets. Date of travel: Enter the date of the affected journey. If you experienced disruption on more than one date, for example on the outbound and inbound of a return journey, you'll need to make separate claims for each. Booking reference (PNR): This six-letter booking reference appears in your confirmation email (it's your collection reference) and/or your physical ticket. In French, the PNR is referred to as Dossier Voyage. Ticket number (TCN): This nine-digit number will follow the letters IV on your tickets. For help finding your PNR and ticket number, see sample tickets below. It isn't usually necessary to supply the tickets themselves, but you should always keep your original tickets and your receipts until your case is resolved. To receive compensation in Eurostar vouchers, use Eurostar's Compensation Calculator to check your eligibility and submit a claim. Your vouchers will be issued to the email address you specify, and can be redeemed on Eurostar's website. To receive a cash refund (to UK bank accounts), fill in this form. Your refund will be paid to the bank account you specify. To receive a cash refund (to bank accounts outside the UK), fill in this form to contact Eurostar or email: traveller.care@eurostar.com. You should enter "Exchanges and Refunds" as the subject of your enquiry, and include your PNR and ticket number/s in the body of the text. You will required to supply information such as an IBAN number or Swift code to receive your refund by international transfer. Refunds will usually be paid (or vouchers issued) within 28 days of Eurostar receiving your claim. It can take longer if there is a high volume of claims, for instance during a national rail strike. If you travelled in a group you'll need to complete the above process for each passenger, entering one ticket number at a time. If you have booked a Eurostar + TGV through-fare, known as a " French Connection" ticket, please contact us using our "More Help" Beacon in the bottom right hand corner of our contact page and let us know the full details of your claim. In many cases, your costs will be covered by your insurance provider, so it’s a good idea to check with them first. Transport between the station and your accommodation. The cost of calling anyone who was waiting for you at your destination. Eurostar will not cover any other expenses, such as the cost of alternative transport if you decided not to wait for the next available Eurostar train. You would need to pursue a refund for this kind of additional cost via your travel insurer. To submit a claim that includes additional expenses, you should fill in this form to contact Eurostar or email: traveller.care@eurostar.com including an attachment that contains legible scans or photos of relevant receipts. We recommend compiling all receipts into one, clear document such as a pdf. Your ticket number (TCN) is a nine-digit number which follows the letters "IV" on your tickets. Your booking reference (PNR) is a six-letter booking reference appears in your confirmation email (it's your collection reference) and/or your physical ticket. In French, the PNR is referred to as Dossier Voyage. If your tickets are Sparpreis Europa tickets, which include Eurostar and ICE trains to/from Germany, they will be issued by Deutsche Bahn. 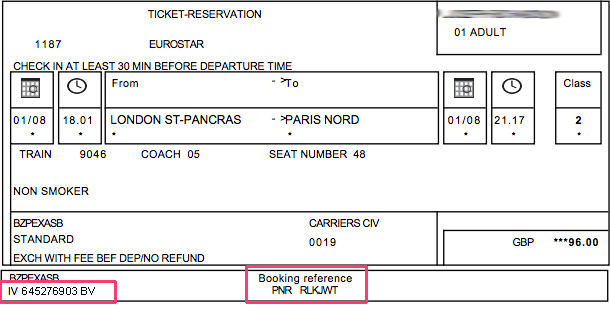 Eurostar will issue paper tickets (see above) at check-in, which contain your PNR and ticket number. If you don't have the paper tickets issued by Eurostar, you PNR is also displayed as Auftragsnummer on your print-at-home ticket.